A survey reveals interoperability concerns are a thorn in the side of senior finance executives. Adoption of value-based programs by commercial payers has nearly doubled since 2015, and almost three-quarters of finance executives report positive financial results from their value-based efforts. Yet rollout of commercial programs is much slower than anticipated thanks to several familiar issues. That's according to "Value-Based Payment Readiness," an executive survey conducted by the Healthcare Financial Management Association (HFMA) and sponsored by Humana. "The No. 1 obstacle to increasing adoption of value-based payment for the senior finance executives we surveyed is interoperability. More than 70% said that increasing their internal interoperability capabilities—within their organizations—is extremely important for value-based payment readiness," says Richard L. Gundling, FHFMA, CMA, senior vice president of healthcare financial practices for HFMA. "As many health systems experience, having different IT systems across the organization that don't talk to each other limits the ability to use information to improve care and reduce the cost of care." External interoperability, especially the ability to share information with health plans, was identified by one-half of the survey participants as an extremely important need. The external barrier cited most often was the lack of a national common data definition and standards, effectively blocking the "electronic exchange of health information [that] is a cornerstone of a high-value health care system," Gundling says. To determine the state of and barriers to value-based payment models, HFMA researchers surveyed 117 randomly selected senior financial executives about their provider and payer organizations' value-based payment readiness. The majority (74%) were executive-level professionals, while 26% were director level. On the provider side, 43% of participants represented hospitals with up to 99 beds, 41% with 100 to 299 beds, and 16% with 300 or more beds. 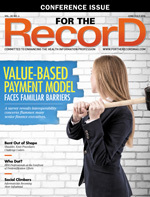 The survey focused on six key areas of value-based payment readiness: current state, projected need, anticipated readiness gaps, penetration of value-based payments, financial impact, and challenges and solutions. The results were a mixed bag of cautious optimism, small successes, and concerns over the issues that stand in the way of broader adoption. Overall, respondents generally did not view their organizations as highly capable in most areas that support value-based payment. External interoperability was identified as the weakest link, with just 18% ranking their organizations as highly or extremely capable, while 31% ranked assessing return on investment (ROI) and 32% ranked chronic care management as at least highly capable. In fact, only eligibility verification was rated as highly or extremely capable by the majority of (72%) respondents. Overcoming the interoperability barrier is crucial to advancing value-based programs, with 74% of respondents anticipating an extremely important need for capabilities around interoperability and 50% around external interoperability. The solution, however, cannot come from vendors alone. Gundling notes that while it's true that many EHR vendors are deploying products with limited interoperability, hospitals and health systems bear some of the blame. "They are not necessarily demanding interoperability from vendors. Limiting information sharing to protect market share or maintain volume is a short-term strategy that will backfire in the long run. We all need to get on the same page when it comes to promoting interoperability," he says. By subtracting the percentage viewing their organizations as likely to be highly or extremely capable from the percentage viewing an area as extremely important in three years, HFMA researchers were able to identify several key readiness gaps. Again, internal and external interoperability dominated, at 33% and 32%, respectively, followed by chronic care management (23%) and assessing ROI (21%). Care standardization (18%), real-time data access (17%), postdischarge follow-up (15%), and business intelligence (10%) rounded out anticipated gaps. While eliminating the interoperability barrier will go a long way toward closing these gaps, it is a highly complex proposition for reasons beyond standards, according to Trish Birch, senior vice president and global health care consulting practice leader at Cognizant. "Too many people own part of the [interoperability] value chain, which is a huge problem with the business case," she says. "When you look at the process for chronic care management—and this is where the ROI problem comes in—there are too many people who own part of the process. ROI presupposes automation. Everyone [also] has to play nice and you have to give them some economic incentives" to address the problem. Birch cites the work Cognizant did on a solution to automate orders for home monitoring devices upon a patient's discharge from the hospital. It sounds simple enough. The physician writes the order in the EMR, which sends it to the company that handles the facility's supply chain, which ships the device to the patient's home where it is installed and can begin transmitting information back to the EMR. There, data are automatically analyzed and alerts are triggered when the system's algorithm identifies a potential issue. "It sounds straightforward, but it's not," Birch says. "The hospital, physicians, and EMR [vendor] need to cooperate to get the integration and change management done. Then you have the suppliers, who have to have the capabilities to very cost-effectively manage and ship the devices, and provide the clinical call center and analytics piece. All parties need their role in automating this process to be economically worthwhile, but still keep [costs to the patient] below a set price. And that's all for just one narrow postdischarge monitoring process. This is where scale and the right digital tools will matter. "There are a lot of unproductive components in health care processes. They need to be squeezed out [and] simple tools [provided]" if value-based payment programs are going to truly succeed, she adds. "At the core, there has to be a lot of simplification of process and rearchitecting of the value chain." In addition to barriers, survey respondents were asked to identify the most significant challenges related to value-based payment models. They cited poor data access, the inability to collect and manage data, inconsistencies between payers, and the inability to project costs, lost revenue, and/or risk. Exacerbating these challenges, 35% said their organizations aren't equipped with the tools and technology to help control costs—a particularly revealing statistic when examined in the context of the anticipated need for improved chronic care management, better ROI assessment, and, once again, interoperability. "Having a holistic view of patients' health information, and in a timely, efficient manner, will be correlated with improving chronic care management and assessing returns on investments," says Mike Funk, Humana's vice president of the Office of the Chief Medical Officer. He points to patients with chronic conditions as prime beneficiaries of the ability to share health information with primary care physicians, specialists, and health plans, noting that "readily available and complete information would enhance the accuracy of data that can be used in our predictive models [and] analytics and help the patient's disease from progressing and/or helping to manage their condition." For people with diabetes, the ability to detect acute events such as the development of a foot ulcer could prevent amputation and hospitalization—avoiding high-cost interventions and maximizing ROI simply by allowing patients to maintain their current level of health while in their homes. "In this example, the [information] must include not only event-based data like lab results or admission to a hospital but also a patient's health information or records," Funk says. "The patient's health information should be placed [in] the center of the physicians' hands while [still] allowing others in the system to access and update appropriately. [This allows] more complete, current, and accurate patient information to be linked to more accurate predictive analytics, improved decision making, and efficiencies for everyone involved in the health care system." Birch notes that it's not enough to recognize the need for interoperability, automation, and simplification. Organizations need to have scale so they can control an end-to-end process or there needs to be powerful incentives to push payers, providers, and vendors to facilitate change—incentives in the form of regulations and initiatives from the Office of the National Coordinator for Health Information Technology (ONC). She points to the proposed rules recently issued by the ONC as part of its focus on reducing physician documentation. Success will ultimately address two additional challenges identified by the HFMA survey: physician alignment, adoption, and buy-in and limited financial and personnel resources. "You can't have simplified, integrated, and interoperable processes that work better until the health care value chain consolidates," Birch says. While there is consensus on the need to improve value to care purchasers, the same cannot be said for how to build upon the limited momentum that has been achieved to date, according to Gundling. For example, physicians and employers disagree on who is responsible for pushing provider payment reform initiatives, which contributes to a sense of uncertainty and makes progress at any level more difficult to achieve. The proliferation of payment methodologies, the multiple variations of the value-structure theme and their complexity, and the growing pains experienced by the more established models, such as accountable care organizations, adds to the slow pace of progress. Unfortunately for everyone on the health care continuum, this is one race that slow and steady cannot win. "It's time for the industry to pick up the pace. We won't have the luxury of an extended experimentation period for much longer. Potential disrupters are making their moves into traditional health care stakeholders' territory. These disrupters can look at health care through fresh eyes—through consumers' eyes, through purchasers' eyes," says Gundling, adding that the timeframe for the transition to value-based programs is unknown—which makes this transition fundamentally different from almost every other transition undertaken by health systems. "We always know what the time frame is. It's one of the first things we ask," Gundling says. "That's not the case with the biggest transition in health care payment in a generation or more. We don't even know what the tipping point is, when the penetration of value-based payment will have reached a point where it's driving the choices we make, the way we do business. We may only be able to see the tipping point when it's in the rearview mirror." Mike Funk, Humana's vice president of the Office of the Chief Medical Officer, says one reason the health plan collaborated with the Healthcare Financial Management Association (HFMA) for a study on value-based payment readiness was to be able to continually assess progress and understand the barriers and challenges in order to formulate responses that support providers. For example, respondents to an executive survey conducted by the HFMA and sponsored by Humana cited tracking quality metrics as a barrier to success, leading Humana to collect 1,116 measures from 29 data sources and vet them for duplicates, inconsistencies, and clinical relevance. The result was a consolidation of those one thousand-plus metrics into a single set of just 208. "The streamlined set of metrics emphasizes improving patient health outcomes and is aligned with broader industry efforts to standardize measures used to evaluate clinical quality," Funk says. The lack of resources is another barrier Humana has been working to eliminate by evaluating where the organization can lend additional support. For example, Humana may provide assistance in areas such as home health, care coordination, coding, and documentation, "depending on the needs of the provider," Funk says. "Humana can offer these types of resources to enhance the current infrastructure of the practice. For providers contracted in our Medical Home program, Humana also offers a care coordination payment to help offset costs of hiring or increasing care coordination resources within the practice." Finally, to address the challenges of projecting costs, revenue, and/or risk, Humana is looking at how to continue improving its stakeholder collaborations to better emphasize value-based related performance, trends, strategic direction, and progress with its contracted providers. "These collaborations include market leadership from Humana and provider leadership—clinical and administrative—to review open opportunities, joint action plans, KPIs [key performance indicators], and shared best practices to improve value-based performance and the relationships between everyone involved," Funk says. Though adoption of value-based payment methodologies isn't happening as fast as projected—its use nearly doubled to 24% in 2015, which is far short of the 50% projected adoption rate—it was nonetheless sufficient to generate optimism in light of some positive financial outcomes. "We know that adopting a value-based model comes with investments, a lot of work, and, at times, patience. Investments may include enhancements in IT, processes, and infrastructure but also the organization's culture. So, seeing the value-based payment rate doubling in two years was a positive sign," says Mike Funk, Humana's vice president of the Office of the Chief Medical Officer, who points out adoption rates of 26% for negotiated government plans (ie, Medicare Advantage and managed Medicaid plans), 21% for traditional Medicare plans, and 14% for nonmanaged Medicaid plans. In an executive survey conducted by the Healthcare Financial Management Association (HFMA) and sponsored by Humana, 74% of respondents reported that their organizations have achieved positive financial results from value-based payment programs to date, an increase of nearly 25% from 2015. It's a finding Funk calls "interesting, since survey respondents cited the inability to project costs, lost revenue, and/or risk as one of the top challenges to value-based payment adoption. Although projecting costs, lost revenue, and risk is a major barrier for financial executives, seeing that nearly three-quarters are reporting a positive return on investment in their value-based payment models is encouraging." Approximately three-quarters of respondents indicated that regulatory uncertainty such as the Medicare Access and CHIP Reauthorization Act was negatively impacting their ability to forecast the financial impact of value-based plans. However, the majority (60%) also indicated that their physicians will receive at least a neutral or positive payment adjustment under the Merit-based Incentive Payment System. Part of that can be attributed to the fact that most (59%) incentivize physicians based on quality outcomes and performance. This kind of positive projection could go a long way toward gaining greater physician buy-in to value-based payments—or at least help them better understand where that value comes from under these alternative models. "I don't think anyone is suggesting that physicians become experts on all the ins and outs of all the various [value-based] models, but they need to understand the ones they may be involved in," says Richard L. Gundling, FHFMA, CMA, senior vice president of healthcare financial practices for HFMA. "And we need to find ways to make it less complicated so it's less demanding of physicians' time."